David Aspden was born in 1935 in England and migrated to Australia in 1950. He worked as an apprentice painter/sign writer in Port Kembla for twelve years, before pursuing his intention to be an artist, in which he was largely self-taught. He moved to Sydney in 1964, where he remained for the rest of his life. His first solo exhibition was in 1965 at Watters Gallery, with two works shown in the landmark 1968 NGV exhibition on abstraction, 'The field'. In 1971 he was awarded a gold meal at the 'XI Bienal de Sao Paulo in Brazil', and was represented in the exhibition 'Ten Australians' which toured Europe in 1974. In 1980 he spent time in New York at the Australia Council Canal Street studio. In 1995 he won the Wynne Prize, having exhibited in 16 Wynne prizes between 1977-98, plus on Sulman Prize and one Archibald Prize. He died in Sydney in 2005. 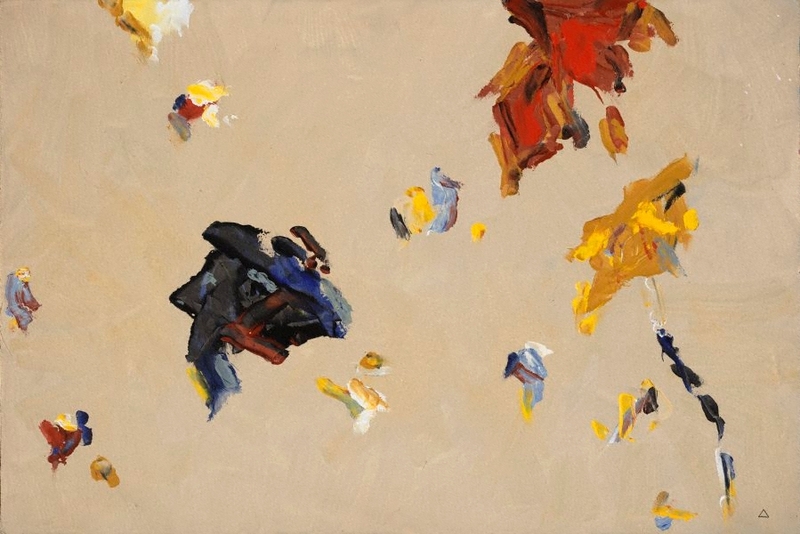 For Aspden, painting was as much an act/process as well as the creation of an all-encompassing colour environment. His early interests lay in international formalist/ hard edge painting, which gave way to a more nuanced and lyrical abstraction influenced by music, landscape and nature. Above all, his work emphasised colour and expressed his remarkable facility for tone, and interest in balancing interlocking shapes, colours, tones and light. Signed and dated upper c. verso, black fibre-tipped pen ".../ Aspden '98/ .../ .../ ...". Signed l.r. corner, black fibre-tipped pen "Δ [artist's monogram]". Helen Campbell with Eric Riddler, David Aspden: the colour of music and place , 'Chronology', pg. 79-85, Sydney, 2011, 69 (colour illus. ), 82, 86-87 (colour illus, detail), 89. Anne Ryan, Look , 'David Aspden - composer of paintings', pg. 26-29, Sydney, Aug 2011, front cover (colour illus., detail), 9 (colour illus. ).